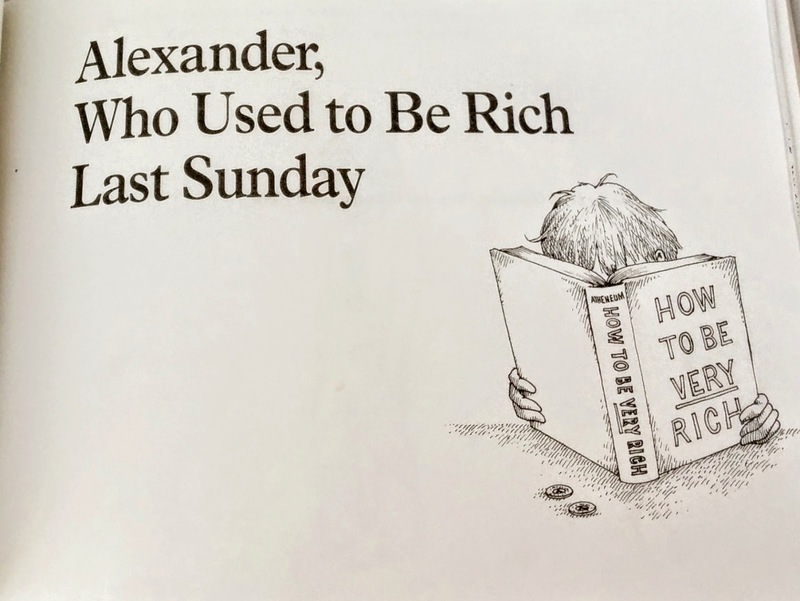 I'd had Alexander and The Terrible, Horrible No Good, Very Bad Day on my mind for a long time as one of my favorite books to review and share. Published in 1972 it's a book I read to my own kids, and a book I remember from my childhood. If you didn't know, Disney made a movie based on Alexander which will be out soon. 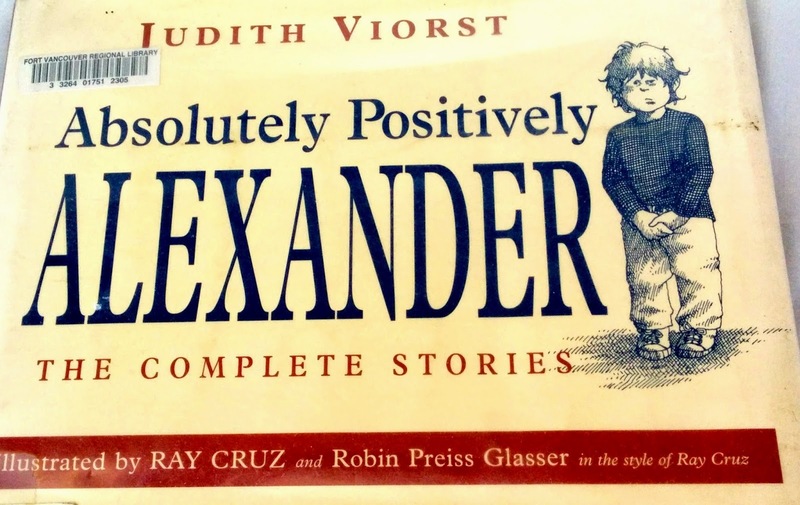 Absolutely Positively Alexander is a great collection of three of the Alexander stories. I was looking on Wikipedia and actually discovered that there is one more Alexander story I've never seen before and now must find: Alexander, Who Is Trying His Best To Be the Best Boy Ever. Judith Viorst captures the attitude of a families precocious, active youngest son perfectly. I recognize this boy because many of my Nanny jobs were with little boys, who grew up to become fun, active little boys who sometimes had bad days. I know this because I raised three boys of my own and have my own Alexander. Her writing style emulates the petulance and exasperation of one whose day started bad and isn't getting better with an ending that offers just enough hope to carry us through to the next day. All three stories in the compilation mirror that same theme. Alexander is a kid whose glass is not only half empty, but when things start to look good, something comes along to make them turn down again -yet at the end of the story he's always lead to a realization that it's not ALL bad after all. I'm pretty sure that a book written like this would a hard time finding a publisher in today's market. Not because of the theme of course. There are loads of grumpy kids books available at the library. 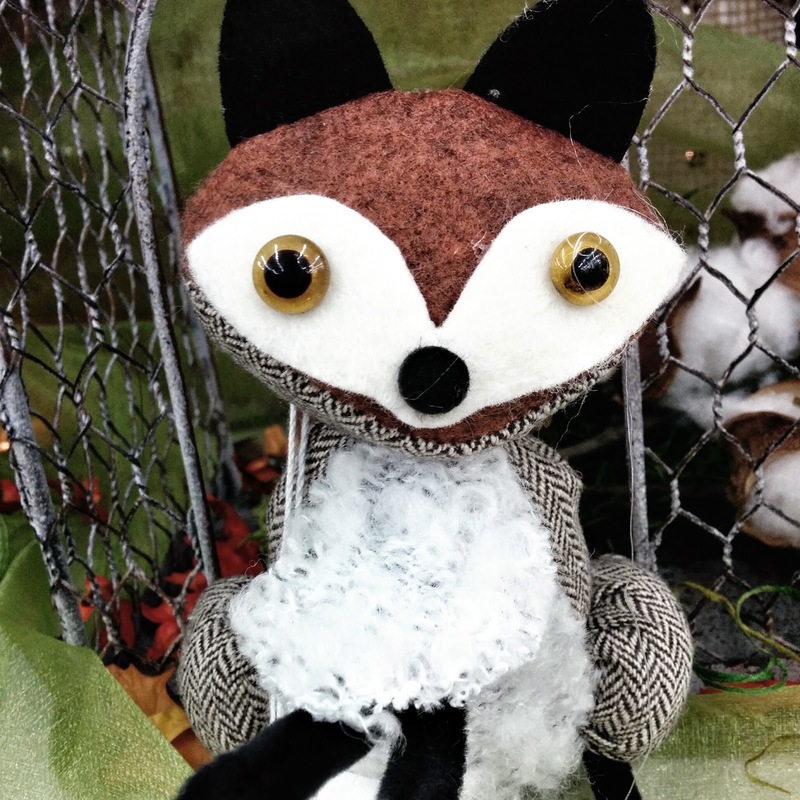 The style of the book, which absolutely embodies the voice of a smart, articulate boy between the ages of eight and eleven, is so out of fashion in children's picture books. 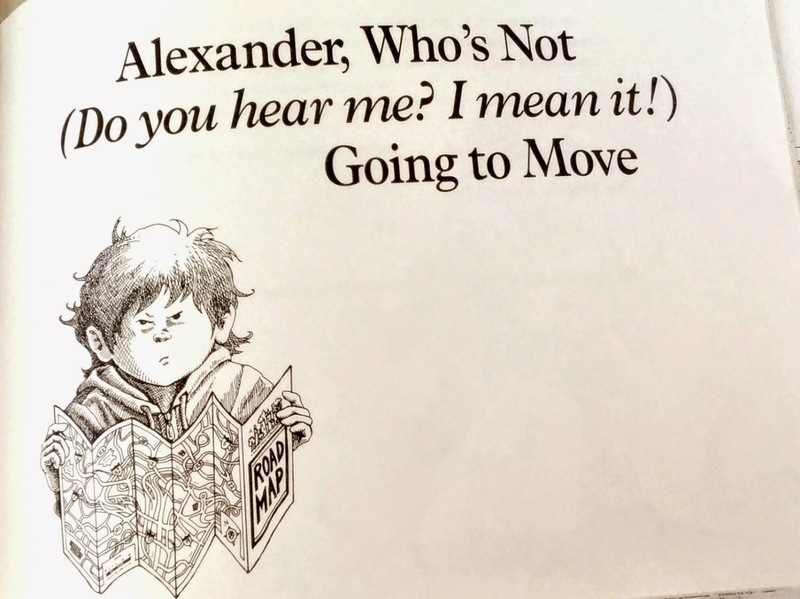 In the opening page of Alexander and the Terrible, Horrible, No Good Very Bad Day, young Alexander wakes up and uses 62 words in one first person sentence to create the setting for the entire story. Sixty Two Words! One sentence! First page! You may not know but let me tell you. That breaks every rule of writing Children's book created in the last twenty years. I am having a hard time not inserting sarcastic comments here about those stupid rules, but I just wanted you to know they were floating around in my head. I'm using a great deal of self control to keep them from streaming down to my fingers and into this post. 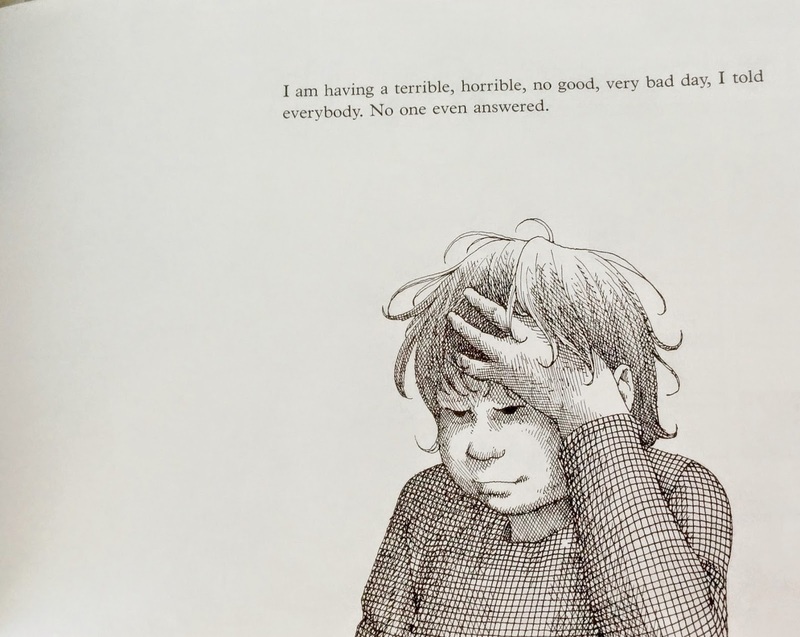 ,Alexander and the Terrible, Horrible, No Good Very Bad Day has been in continuous print since 1972. You can find Alexander in every library in the country. You can find Alexander in most schools across the nation. Plus there is a T.V. adaptation made in 1990 and a couple of theater adaptations and now an upcoming Disney adaption. This is a book that will appeal to school age boys and girls because they have all felt as Alexander feels, like the downtrodden, misunderstood, I- tried-my-best-and-failed, kid. "I am having a terrible, horrible, no good, very bad day, I told everybody. No one even answered." It's easy to read aloud because Alexander's personality shines strongly and every line flows easily. It's fun to read because Alexander is a smart kid who loves big words and isn't afraid to string them together into sentences full of emotion. Children emphasize with him because they have been him. This book is a great discussion opener for feelings and attitudes for school age children. Boys, who might have trouble expressing themselves or describing "why" they feel picked on or defeated, might be able to see themselves in Alexander and open the door for some pretty important conversations. I highly recommend "Absolutely Positively Alexander," as a bedtime storybook, an after school storybook, and a quiet time storybook. I'd share with four through six year olds while sitting down to mealtime (captive audience) and watch it grab their attention (even though they don't have long attention spans,) and I share it seven year olds and older during quiet times and bedtimes.